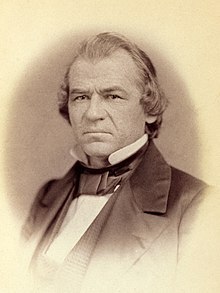 Andrew Johnson (December 29, 1808  July 31, 1875) was the 17th President of the United States , serving from 1865 to 1869. Johnson became president as he was vice president at the time of the assassination of Abraham Lincoln. A Democrat who ran with Lincoln on the National Union ticket, Johnson came to office as the Civil War concluded. The new president favored quick restoration of the seceded states to the Union. His plans did not give protection to the former slaves, and he came into conflict with the Republican-dominated Congress, culminating in his impeachment by the House of Representatives. He was acquitted in the Senate by one vote. Johnson was born in poverty in Raleigh, North Carolina. Apprenticed as a tailor, he worked in several frontier towns before settling in Greeneville, Tennessee. He served as alderman and mayor there before being elected to the Tennessee House of Representatives in 1835. After brief service in the Tennessee Senate, Johnson was elected to the federal House of Representatives in 1843, where he served five two-year terms. He became Governor of Tennessee for four years, and was elected by the legislature to the US Senate in 1857. In his congressional service, he sought passage of the Homestead Bill, which was enacted soon after he left his Senate seat in 1862. As Southern slave states, including Tennessee, seceded to form the Confederate States of America, Johnson remained firmly with the Union. He was the only sitting senator from a Confederate state who did not resign his seat upon learning of his state’s secession. In 1862, Lincoln appointed him as military governor of Tennessee after most of it had been retaken. In 1864, Johnson, as a War Democrat and Southern Unionist, was a logical choice as running mate for Lincoln, who wished to send a message of national unity in his re-election campaign; their ticket easily won. 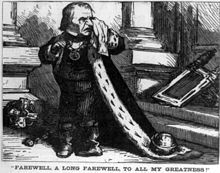 When Johnson was sworn in as vice president in March 1865, he gave a rambling speech, after which he secluded himself to avoid public ridicule. Six weeks later, the assassination of Lincoln made him president. Johnson implemented his own form of Presidential Reconstruction  a series of proclamations directing the seceded states to hold conventions and elections to re-form their civil governments. When Southern states returned many of their old leaders, and passed Black Codes to deprive the freedmen of many civil liberties, Congressional Republicans refused to seat legislators from those states and advanced legislation to overrule the Southern actions. Johnson vetoed their bills, and Congressional Republicans overrode him, setting a pattern for the remainder of his presidency. Johnson opposed the Fourteenth Amendment, which gave citizenship to former slaves. In 1866, Johnson went on an unprecedented national tour promoting his executive policies, seeking to destroy his Republican opponents. As the conflict between the branches of government grew, Congress passed the Tenure of Office Act, restricting Johnson’s ability to fire Cabinet officials. When he persisted in trying to dismiss Secretary of War Edwin Stanton, he was impeached by the House of Representatives, and narrowly avoided conviction in the Senate and removal from office. After failing to win the 1868 Democratic presidential nomination, Johnson left office in 1869. Returning to Tennessee after his presidency, Johnson sought political vindication, and gained it in his eyes when he was elected to the Senate again in 1875, making Johnson the only former president to serve in the Senate. He died just months into his term. While some admire Johnson’s strict constitutionalism, his strong opposition to federally guaranteed rights for African Americans is widely criticized. He is regarded by many historians as one of the worst presidents in American history. 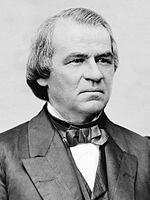 Andrew Johnson was born in Raleigh, North Carolina, on December 29, 1808, to Jacob Johnson (17781812) and Mary (“Polly”) McDonough (17831856), a laundress. He was of English, Scottish, and Irish ancestry. He had a brother William, four years his senior, and an older sister Elizabeth, who died in childhood. Johnson’s birth in a log cabin was a political asset in the mid-19th century, and he would frequently remind voters of his humble origins. Jacob Johnson was a poor man, as had been his father, William Johnson, but he became town constable of Raleigh before marrying and starting a family. He died of an apparent heart attack while ringing the town bell, shortly after rescuing three drowning men, when his son Andrew was three. Polly Johnson worked as a washerwoman and became the sole support of her family. Her occupation was then looked down on, as it often took her into other homes unaccompanied. There were even rumors that Andrew, who did not resemble his brother or sister, had been fathered by another man. Polly Johnson eventually remarried, to Turner Doughtry, who was as poor as she was. Johnson’s mother apprenticed her son William to a tailor, James Selby. Andrew also became an apprentice in Selby’s shop at age ten and was legally bound to serve until his 21st birthday. Johnson lived with his mother for part of his service, and one of Selby’s employees taught him rudimentary literacy skills. His education was augmented by citizens who would come to Selby’s shop to read to the tailors as they worked. Even before he became an apprentice, Johnson came to listen. The readings caused a lifelong love of learning, and one of his biographers, Annette Gordon-Reed, suggests that Johnson, later a gifted public speaker, learned the art as he threaded needles and cut cloth. Johnson was not happy at James Selby’s, and after about five years, both he and his brother ran away. Selby responded by placing a reward for their return: “Ten Dollars Reward. 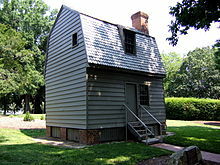 Ran away from the subscriber, two apprentice boys, legally bound, named William and Andrew Johnson … to any person who will deliver said apprentices to me in Raleigh, or I will give the above reward for Andrew Johnson alone.” The brothers went to Carthage, North Carolina, where Andrew Johnson worked as a tailor for several months. Fearing he would be arrested and returned to Raleigh, Johnson moved to Laurens, South Carolina. He found work quickly, met his first love, Mary Wood, and made her a quilt as a gift. However, she rejected his marriage proposal. He returned to Raleigh, hoping to buy out his apprenticeship, but could not come to terms with Selby. Unable to stay in Raleigh, where he risked being apprehended for abandoning Selby, he decided to move west. In Greeneville, Johnson established a successful tailoring business in the front of his home. In 1827, at the age of 18, he married 16-year-old Eliza McCardle, the daughter of a local shoemaker. The pair were married by Justice of the Peace Mordecai Lincoln, first cousin of Thomas Lincoln, whose son would become president. The Johnsons were married for almost 50 years and had five children: Martha (1828), Charles (1830), Mary (1832), Robert (1834), and Andrew Jr. (1852). Though she suffered from Tuberculosis, Eliza supported her husband’s endeavors. She taught him mathematics skills and tutored him to improve his writing. Shy and retiring by nature, Eliza Johnson usually remained in Greeneville during Johnson’s political rise. She was not often seen during her husband’s presidency; their daughter Martha usually served as official hostess. Johnson’s tailoring business prospered during the early years of the marriage, enabling him to hire help and giving him the funds to invest profitably in real estate. He later boasted of his talents as a tailor, “my work never ripped or gave way.” He was a voracious reader. Books about famous orators aroused his interest in political dialogue, and he had private debates on the issues of the day with customers who held opposing views. He also took part in debates at Greeneville College. Johnson helped organize a mechanics’ (working men’s) ticket in the 1829 Greeneville municipal election. He was elected town alderman, along with his friends Blackston McDannel and Mordecai Lincoln. Following the 1831 Nat Turner slave rebellion, a state convention was called to pass a new constitution, including provisions to disenfranchise free people of color. The convention also wanted to reform real estate tax rates, and provide ways of funding improvements to Tennessee’s infrastructure. The constitution was submitted for a public vote, and Johnson spoke widely for its adoption; the successful campaign provided him with statewide exposure. On January 4, 1834, his fellow aldermen elected him mayor of Greeneville. In 1835, Johnson made a bid for election to the “floater” seat which Greene County shared with neighboring Washington County in the Tennessee House of Representatives. According to his biographer, Hans L. Trefousse, Johnson “demolished” the opposition in debate and won the election with almost a two to one margin. Soon after taking his seat, Johnson purchased his first slave, Dolly, aged 14. Dolly had three children over the years. Johnson had the reputation of treating his slaves kindly, and the fact that Dolly was dark-skinned, and her offspring much lighter, led to speculation both during and after his lifetime that he was the father. During his Greeneville days, Johnson joined the Tennessee Militia as a member of the 90th Regiment. He attained the rank of colonel, though while an enrolled member, Johnson was fined for an unknown offense. Afterwards, he was often addressed or referred to by his rank. Johnson believed, as did many Southern Democrats, that the Constitution protected private property, including slaves, and thus prohibited the federal and state governments from abolishing slavery. He won a second term in 1845 against Wiliam G. Brownlow, presenting himself as the defender of the poor against the aristocracy. In his second term, Johnson supported the Polk administration’s decision to fight the Mexican War, seen by some Northerners as an attempt to gain territory to expand slavery westward, and opposed the Wilmot Proviso, a proposal to ban slavery in any territory gained from Mexico. He introduced for the first time his Homestead Bill, to grant 160 acres (65 ha) to people willing to settle the land and gain title to it. This issue was especially important to Johnson because of his own humble beginnings. Once the Speaker election had concluded and Congress was ready to conduct legislative business, the issue of slavery took center stage. Northerners sought to admit California, a free state, to the Union. Kentucky’s Henry Clay introduced in the Senate a series of resolutions, the Compromise of 1850, to admit California and pass legislation sought by each side. Johnson voted for all the provisions except for the abolition of slavery in the nation’s capital. He pressed resolutions for constitutional amendments to provide for popular election of senators (then elected by state legislatures) and of the president (chosen by the Electoral College), and limiting the tenure of federal judges to 12 years. These were all defeated. If Johnson considered retiring from politics upon deciding not to seek re-election, he soon changed his mind. His political friends began to maneuver to get him the nomination for governor. The Democratic convention unanimously named him, though some party members were not happy at his selection. The Whigs had won the past two gubernatorial elections, and still controlled the legislature. That party nominated Henry, making the “Henry-mandering” of the First District an immediate issue. The two men debated in county seats the length of Tennessee before the meetings were called off two weeks before the August 1853 election due to illness in Henry’s family. Johnson won the election by 63,413 votes to 61,163; some votes for him were cast in return for his promise to support Whig Nathaniel Taylor for his old seat in Congress. Tennessee’s governor had little power: Johnson could propose legislation but not veto it, and most appointments were made by the Whig-controlled legislature. Nevertheless, the office was a “bully pulpit” that allowed him to publicize himself and his political views. He succeeded in getting the appointments he wanted in return for his endorsement of John Bell, a Whig, for one of the state’s U.S. Senate seats. In his first biennial speech, Johnson urged simplification of the state judicial system, abolition of the Bank of Tennessee, and establishment of an agency to provide uniformity in weights and measures; the last was passed. Johnson was critical of the Tennessee common school system and suggested funding be increased via taxes, either statewide or county by countya mixture of the two was passed. Reforms carried out during Johnson’s time as governor included the foundation of the State’s public library (making books available to all) and its first public school system, and the initiation of regular state fairs to benefit craftsmen and farmers. When the presidential election of 1856 approached, Johnson hoped to be nominated; some Tennessee county conventions designated him a “favorite son“. His position that the best interests of the Union were served by slavery in some areas made him a practical compromise candidate for president. He was never a major contender; the nomination fell to former Pennsylvania senator James Buchanan. Though he was not impressed by either, Johnson campaigned for Buchanan and his running mate, John C. Breckinridge, who were elected. The new senator took his seat when Congress convened in December 1857 (the term of his predecessor, James C. Jones, had expired in March). He came to Washington as usual without his wife and family; Eliza would visit Washington only once during Johnson’s first time as senator, in 1860. Johnson immediately set about introducing the Homestead Bill in the Senate, but as most senators who supported it were Northern (many associated with the newly founded Republican Party), the matter became caught up in suspicions over the slavery issue. Southern senators felt that those who took advantage of the provisions of the Homestead Bill were more likely to be Northern non-slaveholders. The issue of slavery had been complicated by the Supreme Court’s ruling earlier in the year in Dred Scott v. Sandford that slavery could not be prohibited in the territories. Johnson, a slaveholding senator from a Southern state, made a major speech in the Senate the following May in an attempt to convince his colleagues that the Homestead Bill and slavery were not incompatible. Nevertheless, Southern opposition was key to defeating the legislation, 3022. In 1859, it failed on a procedural vote when Vice President Breckinridge broke a tie against the bill, and in 1860, a watered-down version passed both houses, only to be vetoed by Buchanan at the urging of Southerners. Johnson continued his opposition to spending, chairing a committee to control it. He argued against funding to build Washington, D.C.’s infrastructure, stating that it was unfair to expect state citizens to pay for the city’s streets, even if it was the seat of government. He opposed spending money for troops to put down the revolt by the Mormons in Utah Territory, arguing for temporary volunteers as the United States should not have a standing army. In October 1859, abolitionist John Brown and sympathizers raided the federal arsenal at Harpers Ferry, Virginia (today West Virginia). Tensions in Washington between pro- and anti-slavery forces increased greatly. Johnson gave a major speech in the Senate in December, decrying Northerners who would endanger the Union by seeking to outlaw slavery. The Tennessee senator stated that “all men are created equal” from the Declaration of Independence did not apply to African Americans, since the Constitution of Illinois contained that phraseand that document barred voting by African Americans. Johnson took to the Senate floor after the election, giving a speech well received in the North, “I will not give up this government … No; I intend to stand by it … and I invite every man who is a patriot to … rally around the altar of our common country … and swear by our God, and all that is sacred and holy, that the Constitution shall be saved, and the Union preserved.” As Southern senators announced they would resign if their states seceded, he reminded Mississippi Senator Jefferson Davis that if Southerners would only hold to their seats, the Democrats would control the Senate, and could defend the South’s interests against any infringement by Lincoln. Gordon-Reed points out that while Johnson’s belief in an indissoluble Union was sincere, he had alienated Southern leaders, including Davis, who would soon be the president of the Confederate States of America, formed by the seceding states. If the Tennessean had backed the Confederacy, he would have had small influence in its government. Johnson returned home when his state took up the issue of secession. His successor as governor, Isham G. Harris, and the legislature, organized a referendum on whether to have a constitutional convention to authorize secession; when that failed, they put the question of leaving the Union to a popular vote. Despite threats on Johnson’s life, and actual assaults, he campaigned against both questions, sometimes speaking with a gun on the lectern before him. Although Johnson’s eastern region of Tennessee was largely against secession, the second referendum passed, and in June 1861, Tennessee joined the Confederacy. Believing he would be killed if he stayed, Johnson fled through the Cumberland Gap, where his party was in fact shot at. He left his wife and family in Greeneville. As the only member from a seceded state to remain in the Senate and the most prominent Southern Unionist, Johnson had Lincoln’s ear in the early months of the war. With most of Tennessee in Confederate hands, Johnson spent congressional recesses in Kentucky and Ohio, trying in vain to convince any Union commander who would listen to conduct an operation into East Tennessee. Johnson’s first tenure in the Senate came to a conclusion in March 1862 when Lincoln appointed him military governor of Tennessee. Much of the central and western portions of that seceded state had been recovered. Although some argued that civil government should simply resume once the Confederates were defeated in an area, Lincoln chose to use his power as commander in chief to appoint military governors over Union-controlled Southern regions. The Senate quickly confirmed Johnson’s nomination along with the rank of brigadier general. In response, the Confederates confiscated his land and his slaves, and turned his home into a military hospital. Later in 1862, after his departure from the Senate and in the absence of most Southern legislators, the Homestead Bill was finally enacted. Along with legislation for land-grant colleges and for the transcontinental railroad, the Homestead Bill has been credited with opening the American West to settlement. As military governor, Johnson sought to eliminate rebel influence in the state. He demanded loyalty oaths from public officials, and shut down all newspapers owned by Confederate sympathizers. Much of eastern Tennessee remained in Confederate hands, and the ebb and flow of war during 1862 sometimes brought Confederate control again close to Nashville. However, the Confederates allowed his wife and family to pass through the lines to join him. Johnson undertook the defense of Nashville as best he could, though the city was continually harassed by cavalry raids led by General Nathan Bedford Forrest. Relief from Union regulars did not come until William S. Rosecrans defeated the Confederates at Murfreesboro in early 1863. Much of eastern Tennessee was captured later that year. When Lincoln issued the Emancipation Proclamation in January 1863, declaring freedom for all slaves in Confederate-held areas, he exempted Tennessee at Johnson’s request. The proclamation increased the debate over what should become of the slaves after the war, as not all Unionists supported abolition. Johnson finally decided that slavery had to end. He wrote, “If the institution of slavery … seeks to overthrow it , then the Government has a clear right to destroy it”. He reluctantly supported efforts to enlist former slaves into the Union Army, feeling that African Americans should perform menial tasks to release white Americans to do the fighting. Nevertheless, he succeeded in recruiting 20,000 black soldiers to serve the Union. In 1860, Lincoln’s running mate had been Maine Senator Hannibal Hamlin. Vice President Hamlin had served competently, was in good health, and was willing to run again. Nevertheless, Johnson emerged as running mate for Lincoln’s re-election bid in 1864. Lincoln considered several War Democrats for the ticket in 1864, and sent an agent to sound out General Benjamin Butler as a possible running mate. In May 1864, the President dispatched General Daniel Sickles to Nashville on a fact-finding mission. Although Sickles denied he was there either to investigate or interview the military governor, Johnson biographer Hans L. Trefousse believes Sickles’s trip was connected to Johnson’s subsequent nomination for vice president. According to historian Albert Castel in his account of Johnson’s presidency, Lincoln was impressed by Johnson’s administration of Tennessee. 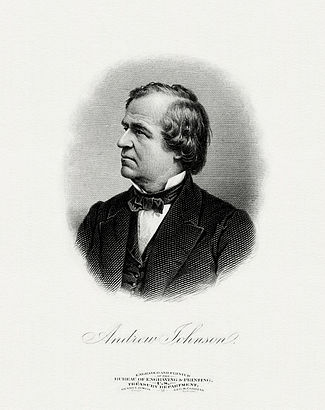 Gordon-Reed points out that while the Lincoln-Hamlin ticket might have been considered geographically balanced in 1860, “having Johnson, the southern War Democrat, on the ticket sent the right message about the folly of secession and the continuing capacity for union within the country.” Another factor was the desire of Secretary of State William Seward to frustrate the vice-presidential candidacy of his fellow New Yorker, former senator Daniel S. Dickinson, a War Democrat, as Seward would probably have had to yield his place if another New Yorker became vice president. Johnson, once he was told by reporters the likely purpose of Sickles’ visit, was active on his own behalf, giving speeches and having his political friends work behind the scenes to boost his candidacy. To sound a theme of unity, Lincoln in 1864 ran under the banner of the National Union Party, rather than the Republicans. At the party’s convention in Baltimore in June, Lincoln was easily nominated, although there had been some talk of replacing him with a Cabinet officer or one of the more successful generals. After the convention backed Lincoln, former Secretary of War Simon Cameron offered a resolution to nominate Hamlin, but it was defeated. Johnson was nominated for vice president by C.M. Allen of Indiana with an Iowa delegate as seconder. On the first ballot, Johnson led with 200 votes to 150 for Hamlin and 108 for Dickinson. On the second ballot, Kentucky switched to vote for Johnson, beginning a stampede. Johnson was named on the second ballot with 491 votes to Hamlin’s 17 and eight for Dickinson; the nomination was made unanimous. Lincoln expressed pleasure at the result, “Andy Johnson, I think, is a good man.” When word reached Nashville, a crowd assembled and the military governor obliged with a speech contending his selection as a Southerner meant that the rebel states had not actually left the Union. Although it was unusual at the time for a national candidate to actively campaign, Johnson gave a number of speeches in Tennessee, Kentucky, Ohio, and Indiana. He also sought to boost his chances in Tennessee while re-establishing civil government by making the loyalty oath even more restrictive, in that voters would now have to swear they opposed making a settlement with the Confederacy. The Democratic candidate for president, George McClellan, hoped to avoid additional bloodshed by negotiation, and so the stricter loyalty oath effectively disenfranchised his supporters. Lincoln declined to override Johnson, and their ticket took the state by 25,000 votes. Congress refused to count Tennessee’s electoral votes, but Lincoln and Johnson did not need them, having won in most states that had voted, and easily secured the election. 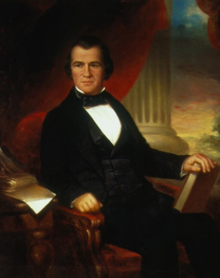 Now Vice President-elect, Johnson was anxious to complete the work of re-establishing civilian government in Tennessee, although the timetable for the election of a new governor did not allow it to take place until after Inauguration Day, March 4. He hoped to remain in Nashville to complete his task, but was told by Lincoln’s advisers that he could not stay, but would be sworn in with Lincoln. In these months, Union troops finished the retaking of eastern Tennessee, including Greeneville. Just before his departure, the voters of Tennessee ratified a new constitution, abolishing slavery, on February 22, 1865. One of Johnson’s final acts as military governor was to certify the results. Johnson traveled to Washington to be sworn in, although according to Gordon-Reed, “in light of what happened on March 4, 1865, it might have been better if Johnson had stayed in Nashville.” He may have been ill; Castel cited typhoid fever, though Gordon-Reed notes that there is no independent evidence for that diagnosis. On the evening of March 3, Johnson attended a party in his honor; he drank heavily. Hung over the following morning at the Capitol, he asked Vice President Hamlin for some whiskey. Hamlin produced a bottle, and Johnson took two stiff drinks, stating “I need all the strength for the occasion I can have.” In the Senate Chamber, Johnson delivered a rambling address as Lincoln, the Congress, and dignitaries looked on. Almost incoherent at times, he finally meandered to a halt, whereupon Hamlin hastily swore him in as vice president. Lincoln, who had watched sadly during the debacle, was sworn in, and delivered his acclaimed Second Inaugural Address. On the afternoon of April 14, 1865, Lincoln and Johnson met for the first time since the inauguration. Trefousse states that Johnson wanted to “induce Lincoln not to be too lenient with traitors”; Gordon-Reed agrees. That night, President Lincoln was shot and mortally wounded by John Wilkes Booth, a Confederate sympathizer. The shooting of the President was part of a conspiracy to assassinate Lincoln, Johnson, and Seward the same night. Seward barely survived his wounds, while Johnson escaped attack as his would-be assassin, George Atzerodt, got drunk instead of killing the vice president. Leonard J. Farwell, a fellow boarder at the Kirkwood House, awoke Johnson with news of Lincoln’s shooting at Ford’s Theatre. Johnson rushed to the President’s deathbed, where he remained a short time, on his return promising, “They shall suffer for this. They shall suffer for this.” Lincoln died at 7:22 am the next morning; Johnson’s swearing in occurred between 10 and 11 am with Chief Justice Salmon P. Chase presiding in the presence of most of the Cabinet. Johnson’s demeanor was described by the newspapers as “solemn and dignified”. Some Cabinet members had last seen Johnson, apparently drunk, at the inauguration. At noon, Johnson conducted his first Cabinet meeting in the Treasury Secretary’s office, and asked all members to remain in their positions. Johnson presided with dignity over Lincoln’s funeral ceremonies in Washington, before his predecessor’s body was sent home to Springfield, Illinois, for burial. Shortly after Lincoln’s death, Union General William T. Sherman reported he had, without consulting Washington, reached an armistice agreement with Confederate General Joseph E. Johnston for the surrender of Confederate forces in North Carolina in exchange for the existing state government remaining in power, with private property rights to be respected. This did not even acknowledge the freedom of those in slavery. This was not acceptable to Johnson or the Cabinet who sent word for Sherman to secure the surrender without making political deals, which he did. Further, Johnson placed a $100,000 bounty (equivalent to $1.56 million in 2016) on Confederate President Davis, then a fugitive, which gave him the reputation of a man who would be tough on the South. More controversially, he permitted the execution of Mary Surratt for her part in Lincoln’s assassination. Surratt was executed with three others, including Atzerodt, on July 7, 1865. Johnson had three goals in Reconstruction. He sought a speedy restoration of the states, on the grounds that they had never truly left the Union, and thus should again be recognized once loyal citizens formed a government. To Johnson, African-American suffrage was a delay and a distraction; it had always been a state responsibility to decide who should vote. Second, political power in the Southern states should pass from the planter class to his beloved “plebeians”. Johnson feared that the freedmen, many of whom were still economically bound to their former masters, might vote at their direction. Johnson’s third priority was election in his own right in 1868, a feat no one who had succeeded a deceased president had managed to accomplish, attempting to secure a Democratic anti Congressional Reconstruction coalition in the South. Johnson’s first Reconstruction actions were two proclamations, with the unanimous backing of his Cabinet, on May 29. One recognized the Virginia government led by provisional Governor Francis Pierpont. The second provided amnesty for all ex-rebels except those holding property valued at $20,000 or more; it also appointed a temporary governor for North Carolina and authorized elections. Neither of these proclamations included provisions regarding black suffrage or freedmen’s rights. The President ordered constitutional conventions in other former rebel states. As Southern states began the process of forming governments, Johnson’s policies received considerable public support in the North, which he took as unconditional backing for quick reinstatement of the South. While he received such support from the white South, he underestimated the determination of Northerners to ensure that the war had not been fought for nothing. It was important, in Northern public opinion, that the South acknowledge its defeat, that slavery be ended, and that the lot of African Americans be improved. Voting rights were less importantafter all, only a handful of Northern states (mostly in New England) gave African-American men the right to vote on the same basis as whites, and in late 1865, Connecticut, Wisconsin, and Minnesota voted down African-American suffrage proposals by large margins. Northern public opinion tolerated Johnson’s inaction on black suffrage as an experiment, to be allowed if it quickened Southern acceptance of defeat. Instead, white Southerners felt emboldened. A number of Southern states passed Black Codes, binding African-American laborers to farms on annual contracts they could not quit, and allowing law enforcement at whim to arrest them for vagrancy and rent out their labor. Most Southerners elected to Congress were former Confederates, with the most prominent being Georgia Senator-designate and former Confederate vice president Alexander Stephens. Congress assembled in early December 1865; Johnson’s conciliatory annual message to them was well received. Nevertheless, Congress refused to seat the Southern legislators and established a committee to recommend appropriate Reconstruction legislation. Northerners were outraged at the idea of unrepentant Confederate leaders, such as Stephens, rejoining the federal government at a time when emotional wounds from the war remained raw. They saw the Black Codes placing African Americans in a position barely above slavery. Republicans also feared that restoration of the Southern states would return the Democrats to power. In addition, according to David O. Stewart in his book on Johnson’s impeachment, “the violence and poverty that oppressed the South would galvanize the opposition to Johnson”. Congress was reluctant to confront the President, and initially only sought to fine-tune Johnson’s policies towards the South. According to Trefousse, “If there was a time when Johnson could have come to an agreement with the moderates of the Republican Party, it was the period following the return of Congress”. The President was unhappy about the provocative actions of the Southern states, and about the continued control by the antebellum elite there, but made no statement publicly, believing that Southerners had a right to act as they did, even if it was unwise to do so. By late January 1866, he was convinced that winning a showdown with the Radical Republicans was necessary to his political plans  both for the success of Reconstruction and for re-election in 1868. He would have preferred that the conflict arise over the legislative efforts to enfranchise African Americans in the District of Columbia, a proposal that had been defeated overwhelmingly in an all-white referendum. A bill to accomplish this passed the House of Representatives, but to Johnson’s disappointment, stalled in the Senate before he could veto it. 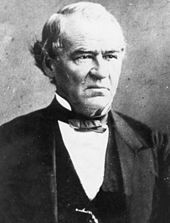 Illinois Senator Lyman Trumbull, leader of the Moderate Republicans and Chairman of the Judiciary Committee, was anxious to reach an understanding with the President. He ushered through Congress a bill extending the Freedmen’s Bureau beyond its scheduled abolition in 1867, and the first Civil Rights Bill, to grant citizenship to the freedmen. Trumbull met several times with Johnson, and was convinced the President would sign the measures (Johnson rarely contradicted visitors, often fooling those who met with him into thinking he was in accord). In fact, the President opposed both bills as infringements on state sovereignty. Additionally, both of Trumbull’s bills were unpopular among white Southerners, whom Johnson hoped to include in his new party. Johnson vetoed the Freedman’s Bureau bill on February 18, 1866, to the delight of white Southerners and the puzzled anger of Republican legislators. He considered himself vindicated when a move to override his veto failed in the Senate the following day. Johnson believed that the Radicals would now be isolated and defeated, and that the Moderate Republicans would form behind him; he did not understand that Moderates too wanted to see African Americans treated fairly. On February 22, 1866, Washington’s Birthday, Johnson gave an impromptu speech to supporters who had marched to the White House and called for an address in honor of the first president. In his hour-long speech, he instead referred to himself over 200 times. More damagingly, he also spoke of “men … still opposed to the Union” to whom he could not extend the hand of friendship he gave to the South. 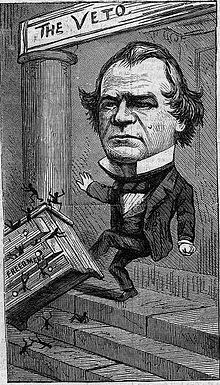 When called upon by the crowd to say who they were, Johnson named Pennsylvania Congressman Thaddeus Stevens, Massachusetts Senator Charles Sumner, and abolitionist Wendell Phillips, and accused them of plotting his assassination. Republicans viewed the address as a declaration of war, while one Democratic ally estimated Johnson’s speech cost the party 200,000 votes in the 1866 congressional midterm elections. Although strongly urged by Moderates to sign the Civil Rights Bill, Johnson broke decisively with them by vetoing it on March 27. In his veto message, he objected to the measure because it conferred citizenship on the freedmen at a time when 11 out of 36 states were unrepresented in the Congress, and that it discriminated in favor of African Americans and against whites. Within three weeks, Congress had overridden his veto, the first time that had been done on a major bill in American history. The veto of the Civil Rights Act of 1866, often seen as a key mistake of Johnson’s presidency, convinced Moderates there was no hope of working with him. Historian Eric Foner in his volume on Reconstruction views it as “the most disastrous miscalculation of his political career”. According to Stewart, the veto was “for many his defining blunder, setting a tone of perpetual confrontation with Congress that prevailed for the rest of his presidency”. Congress also proposed the Fourteenth Amendment to the states. Written by Trumbull and others, it was sent for ratification by state legislatures in a process in which the president plays no part, though Johnson opposed it. The amendment was designed to put the key provisions of the Civil Rights Act into the Constitution, but also went further. The amendment extended citizenship to every person born in the United States (except Indians on reservations), penalized states that did not give the vote to freedmen, and most importantly, created new federal civil rights that could be protected by federal courts. It also guaranteed that the federal debt would be paid and forbade repayment of Confederate war debts. Further, it disqualified many former Confederates from office, although the disability could be removedby Congress, not the president. Both houses passed the Freedmen’s Bureau Act a second time, and again the President vetoed it; this time, the veto was overridden. By the summer of 1866, when Congress finally adjourned, Johnson’s method of restoring states to the Union by executive fiat, without safeguards for the freedmen, was in deep trouble. His home state of Tennessee ratified the Fourteenth Amendment despite the President’s opposition. When Tennessee did so, Congress immediately seated its proposed delegation, embarrassing Johnson. 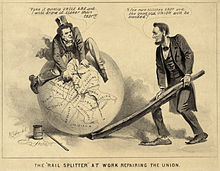 Efforts to compromise failed, and a political war ensued between the united Republicans on one side, and on the other, Johnson and his allies in the Democratic Party, North and South. He called a convention of the National Union Party. Republicans had returned to using their previous identifier; Johnson intended to use the discarded name to unite his supporters and gain election to a full-term, in 1868. The battleground was the election of 1866; Southern states were not allowed to vote. Johnson campaigned vigorously, undertaking a public speaking tour, known as the “Swing Around the Circle“. The trip, including speeches in Chicago, St. Louis, Indianapolis and Columbus, proved politically disastrous, with the President making controversial comparisons between himself and Christ, and engaging in arguments with hecklers. These exchanges were attacked as beneath the dignity of the presidency. The Republicans won by a landslide, increasing their two-thirds majority in Congress, and made plans to control Reconstruction. Johnson blamed the Democrats for giving only lukewarm support to the National Union movement. Even with the Republican victory in November 1866, Johnson considered himself in a strong position. The Fourteenth Amendment had been ratified by none of the Southern or border states except Tennessee, and had been rejected in Kentucky, Delaware, and Maryland. As the amendment required ratification by three-quarters of the states to become part of the Constitution, he believed the deadlock would be broken in his favor, leading to his election in 1868. Once it reconvened in December 1866, an energized Congress began passing legislation, often over a presidential veto; this included the District of Columbia voting bill. Congress admitted Nebraska to the Union over a veto, and the Republicans gained two senators and a state that promptly ratified the amendment. Johnson’s veto of a bill for statehood for Colorado Territory was sustained; enough senators agreed that a district with a population of 30,000 was not yet worthy of statehood to win the day. In January 1867, Congressman Stevens introduced legislation to dissolve the Southern state governments and reconstitute them into five military districts, under martial law. The states would begin again by holding constitutional conventions. African Americans could vote for or become delegates; former Confederates could not. In the legislative process, Congress added to the bill that restoration to the Union would follow the state’s ratification of the Fourteenth Amendment, and completion of the process of adding it to the Constitution. Johnson and the Southerners attempted a compromise, whereby the South would agree to a modified version of the amendment without the disqualification of former Confederates, and for limited black suffrage. The Republicans insisted on the full language of the amendment, and the deal fell through. Although Johnson could have pocket vetoed the First Reconstruction Act as it was presented to him less than ten days before the end of the Thirty-Ninth Congress, he chose to veto it directly on March 2, 1867; Congress overruled him the same day. Also on March 2, Congress passed the Tenure of Office Act over the President’s veto, in response to statements during the Swing Around the Circle that he planned to fire Cabinet secretaries who did not agree with him. This bill, requiring Senate approval for the firing of Cabinet members during the tenure of the president who appointed them and for one month afterwards, was immediately controversial, with some senators doubting that it was constitutional or that its terms applied to Johnson, whose key Cabinet officers were Lincoln holdovers. “The Situation”, a Harper’s Weekly editorial cartoon shows Secretary of War Stanton aiming a cannon labeled “Congress” to defeat Johnson. The rammer is “Tenure of Office Bill” and cannonballs on the floor are “Justice”. Secretary of War Edwin Stanton was an able and hard-working man, but difficult to deal with. Johnson both admired and was exasperated by his War Secretary, who, in combination with General of the Army Grant, worked to undermine the president’s Southern policy from within his own administration. Johnson considered firing Stanton, but respected him for his wartime service as secretary. Stanton, for his part, feared allowing Johnson to appoint his successor and refused to resign, despite his public disagreements with his president. The new Congress met for a few weeks in March 1867, then adjourned, leaving the House Committee on the Judiciary behind, charged with reporting back to the full House whether there were grounds for Johnson to be impeached. This committee duly met, examined the President’s bank accounts, and summoned members of the Cabinet to testify. When a federal court released former Confederate president Davis on bail on May 13 (he had been captured shortly after the war), the committee investigated whether the President had impeded the prosecution. It learned that Johnson was eager to have Davis tried. A bipartisan majority of the committee voted down impeachment charges; the committee adjourned on June 3. Later in June, Johnson and Stanton battled over the question of whether the military officers placed in command of the South could override the civil authorities. The President had Attorney General Henry Stanbery issue an opinion backing his position that they could not. Johnson sought to pin down Stanton either as for, and thus endorsing Johnson’s position, or against, showing himself to be opposed to his president and the rest of the Cabinet. Stanton evaded the point in meetings and written communications. When Congress reconvened in July, it passed a Reconstruction Act against Johnson’s position, waited for his veto, overruled it, and went home. In addition to clarifying the powers of the generals, the legislation also deprived the President of control over the Army in the South. With Congress in recess until November, Johnson decided to fire Stanton and relieve one of the military commanders, General Philip Sheridan, who had dismissed the governor of Texas and installed a replacement with little popular support. He was initially deterred by a strong objection from Grant. On August 5, the President demanded Stanton’s resignation; the secretary refused to quit with Congress out of session. Johnson then suspended him pending the next meeting of Congress as permitted under the Tenure of Office Act; Grant agreed to serve as temporary replacement while continuing to lead the Army. Grant, under protest, followed Johnson’s order transferring Sheridan and another of the district commanders, Daniel Sickles, who had angered Johnson by firmly following Congress’s plan. The President also issued a proclamation pardoning most Confederates, exempting those who held office under the Confederacy, or who had served in federal office before the war and had breached their oaths. Although Republicans expressed anger with his actions, the 1867 elections generally went Democratic. No seats in Congress were directly elected in the polling, but the Democrats took control of the Ohio General Assembly, allowing them to defeat for re-election one of Johnson’s strongest opponents, Senator Benjamin Wade. Voters in Ohio, Connecticut, and Minnesota turned down propositions to grant African Americans the vote. The adverse results momentarily put a stop to Republican calls to impeach Johnson, who was elated by the elections. Nevertheless, once Congress met in November, the Judiciary Committee reversed itself and passed a resolution of impeachment against Johnson. After much debate about whether anything the President had done was a high crime or misdemeanor, the standard under the Constitution, the resolution was defeated by the House of Representatives on December 7, 1867, by a vote of 57 in favor to 108 opposed. Johnson notified Congress of Stanton’s suspension and Grant’s interim appointment. In January 1868, the Senate disapproved of his action, and reinstated Stanton, contending the President had violated the Tenure of Office Act. Grant stepped aside over Johnson’s objection, causing a complete break between them. Johnson then dismissed Stanton and appointed Lorenzo Thomas to replace him. Stanton refused to leave his office, and on February 24, 1868, the House impeached the President for intentionally violating the Tenure of Office Act, by a vote of 128 to 47. The House subsequently adopted eleven articles of impeachment, for the most part alleging that he had violated the Tenure of Office Act, and had questioned the legitimacy of Congress. 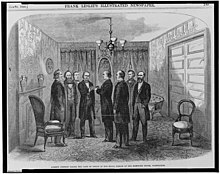 On March 5, 1868, the impeachment trial began in the Senate and lasted almost three months; Congressmen George S. Boutwell, Benjamin Butler and Thaddeus Stevens acted as managers for the House, or prosecutors, and William M. Evarts, Benjamin R. Curtis and former Attorney General Stanbery were Johnson’s counsel; Chief Justice Chase served as presiding judge. The defense relied on the provision of the Tenure of Office Act that made it applicable only to appointees of the current administration. Since Lincoln had appointed Stanton, the defense maintained Johnson had not violated the act, and also argued that the President had the right to test the constitutionality of an act of Congress. Johnson’s counsel insisted that he make no appearance at the trial, nor publicly comment about the proceedings, and except for a pair of interviews in April, he complied. Johnson maneuvered to gain an acquittal; for example, he pledged to Iowa Senator James W. Grimes that he would not interfere with Congress’s Reconstruction efforts. Grimes reported to a group of Moderates, many of whom voted for acquittal, that he believed the President would keep his word. Johnson also promised to install the respected John Schofield as War Secretary. Kansas Senator Edmund G. Ross received assurances that the new, Radical-influenced constitutions ratified in South Carolina and Arkansas would be transmitted to the Congress without delay, an action which would give him and other senators political cover to vote for acquittal. One reason senators were reluctant to remove the President was that his successor would have been Ohio Senator Wade, the president pro tempore of the Senate. Wade, a lame duck who left office in early 1869, was a Radical who supported such measures as women’s suffrage, placing him beyond the pale politically in much of the nation. Additionally, a President Wade was seen as an obstacle to Grant’s ambitions. With the dealmaking, Johnson was confident of the result in advance of the verdict, and in the days leading up to the ballot, newspapers reported that Stevens and his Radicals had given up. On May 16, the Senate voted on the 11th article of impeachment, accusing Johnson of firing Stanton in violation of the Tenure of Office of Act once the Senate had overturned his suspension. Thirty-five senators voted “guilty” and 19 “not guilty”, thus falling short by a single vote of the two-thirds majority required for conviction under the Constitution. Seven RepublicansSenators Grimes, Ross, Trumbull, William Pitt Fessenden, Joseph S. Fowler, John B. Henderson, and Peter G. Van Winklevoted to acquit the President. With Stevens bitterly disappointed at the result, the Senate then adjourned for the Republican National Convention; Grant was nominated for president. The Senate returned on May 26 and voted on the second and third articles, with identical 3519 results. Faced with those results, Johnson’s opponents gave up and dismissed proceedings. Stanton “relinquished” his office on May 26, and the Senate subsequently confirmed Schofield. When Johnson renominated Stanbery to return to his position as Attorney General after his service as a defense manager, the Senate refused to confirm him. Allegations were made at the time and again later that bribery dictated the outcome of the trial. Even when it was in progress, Representative Butler began an investigation, held contentious hearings, and issued a report, unendorsed by any other congressman. Butler focused on a New Yorkbased “Astor House Group”, supposedly led by political boss and editor Thurlow Weed. This organization was said to have raised large sums of money from whiskey interests through Cincinnati lawyer Charles Woolley to bribe senators to acquit Johnson. Butler went so far as to imprison Woolley in the Capitol building when he refused to answer questions, but failed to prove bribery. Soon after taking office as president, Johnson reached an accord with Secretary of State William H. Seward that there would be no change in foreign policy. In practice, this meant that Seward would continue to run things as he had under Lincoln. Seward and Lincoln had been rivals for the nomination in 1860; the victor hoped that Seward would succeed him as president in 1869. At the time of Johnson’s accession, the French had intervened in Mexico, sending troops there. While many politicians had indulged in saber-rattling over the Mexican matter, Seward preferred quiet diplomacy, warning the French through diplomatic channels that their presence in Mexico was not acceptable. Although the President preferred a more aggressive approach, Seward persuaded him to follow his lead. In April 1866, the French government informed Seward that its troops would be brought home in stages, to conclude by November 1867. Seward was an expansionist, and sought opportunities to gain territory for the United States. By 1867, the Russian government saw its North American colony (today Alaska) as a financial liability, and feared losing control as American settlement reached there. It instructed its minister in Washington, Baron Eduard de Stoeckl, to negotiate a sale. De Stoeckl did so deftly, getting Seward to raise his offer from $5 million (coincidentally, the minimum that Russia had instructed de Stoeckl to accept) to $7 million, and then getting $200,000 added by raising various objections. This sum of $7.2 million is equivalent to $123 million in present-day terms. On March 30, 1867, de Stoeckl and Seward signed the treaty, working quickly as the Senate was about to adjourn. Johnson and Seward took the signed document to the President’s Room in the Capitol, only to be told there was no time to deal with the matter before adjournment. The President summoned the Senate into session to meet on April 1; that body approved the treaty, 372. Emboldened by his success in Alaska, Seward sought acquisitions elsewhere. His only success was staking an American claim to uninhabited Wake Island in the Pacific, which would be officially claimed by the U.S. in 1898. He came close with the Danish West Indies as Denmark agreed to sell and the local population approved the transfer in a plebiscite, but the Senate never voted on the treaty and it expired. Another treaty that fared badly was the Johnson-Clarendon convention, negotiated in settlement of the Alabama Claims, for damages to American shipping from British-built Confederate raiders. Negotiated by the United States Minister to Britain, former Maryland senator Reverdy Johnson, in late 1868, it was ignored by the Senate during the remainder of the President’s term. The treaty was rejected after he left office, and the Grant administration later negotiated considerably better terms from Britain. In June 1866, Johnson signed the Southern Homestead Act into law, believing that the legislation would assist poor whites. Around 28,000 land claims were successfully patented, although few former slaves benefitted from the law, fraud was rampant, and much of the best land was off-limits; reserved for grants to veterans or railroads. In June 1868, Johnson signed an eight-hour law passed by Congress that established an eight-hour workday for laborers and mechanics employed by the Federal Government. Although Johnson told members of a Workingmen’s party delegation in Baltimore that he could not directly commit himself to an eight-hour day, he nevertheless told the same delegation that he greatly favoured the “shortest number of hours consistent with the interests of all.” According to Richard F. Selcer, however, the good intentions behind the law were “immediately frustrated” as wages were cut by 20%. Johnson sought nomination by the 1868 Democratic National Convention in New York in July 1868. He remained very popular among Southern whites, and boosted that popularity by issuing, just before the convention, a pardon ending the possibility of criminal proceedings against any Confederate not already indicted, meaning that only Davis and a few others still might face trial. On the first ballot, Johnson was second to former Ohio representative George H. Pendleton, who had been his Democratic opponent for vice president in 1864. Johnson’s support was mostly from the South, and fell away as the ballots passed. On the 22nd ballot, former New York governor Horatio Seymour was nominated, and the President received only four votes, all from Tennessee. Seymour’s operatives sought Johnson’s support, but he long remained silent on the presidential campaign. It was not until October, with the vote already having taken place in some states, that he mentioned Seymour at all, and he never endorsed him. Nevertheless, Johnson regretted Grant’s victory, in part because of their animus from the Stanton affair. In his annual message to Congress in December, Johnson urged the repeal of the Tenure of Office Act and told legislators that had they admitted their Southern colleagues in 1865, all would have been well. He celebrated his 60th birthday in late December with a party for several hundred children, though not including those of President-elect Grant, who did not allow his to go. On Christmas Day 1868, Johnson issued a final amnesty, this one covering everyone, including Davis. He also issued, in his final months in office, pardons for crimes, including one for Dr. Samuel Mudd, controversially convicted of involvement in the Lincoln assassination (he had set Booth’s broken leg) and imprisoned in Fort Jefferson on Florida’s Dry Tortugas. Some expected Johnson to seek to be Tennessee’s governor again or to attempt a return to the Senate, others that he would become a railroad executive. Johnson found Greeneville boring, and his private life was embittered by the suicide of his son Robert in 1869. Seeking vindication for himself, and revenge against his political enemies, he launched a Senate bid soon after returning home. Tennessee had gone Republican, but court rulings restoring the vote to some whites and the violence of the Ku Klux Klan kept down the African-American vote, leading to a Democratic victory in the legislative elections in August 1869. Johnson was seen as a likely victor in the Senate election, although hated by Radical Republicans, and also by some Democrats because of his wartime activities. Although he was at one point within a single vote of victory in the legislature’s balloting, the Republicans eventually elected Henry Cooper over Johnson, 5451. In 1872, there was a special election for an at-large congressional seat for Tennessee; Johnson initially sought the Democratic nomination, but when he saw that it would go to former Confederate general Benjamin F. Cheatham, decided to run as an independent. The former president was defeated, finishing third, but the split in the Democratic Party defeated Cheatham in favor of an old Johnson Unionist ally, Horace Maynard. Johnson returned home after the special session concluded. In late July, convinced some of his opponents were defaming him in the Ohio gubernatorial race, he decided to travel there to give speeches. He began the trip on July 28, and broke the journey at his daughter Mary’s farm near Elizabethton, where his daughter Martha was also staying. That evening he suffered a stroke, but refused medical treatment until the next day, when he did not improve and two doctors were sent for from Elizabethton. He seemed to respond to their ministrations, but suffered another stroke on the evening of July 30, and died early the following morning at the age of 66. President Grant had the “painful duty” of announcing the death of the only surviving past president. Northern newspapers, in their obituaries, tended to focus on Johnson’s loyalty during the war, while Southern ones paid tribute to his actions as president. Johnson’s funeral was held on August 3 in Greeneville. He was buried with his body wrapped in an American flag and a copy of the U.S. Constitution placed under his head, according to his wishes. The burial ground was dedicated as the Andrew Johnson National Cemetery in 1906, and with his home and tailor’s shop, is part of the Andrew Johnson National Historic Site. Johnson acted in accordance with his nature. He had intellectual force but it worked in a groove. Obstinate rather than firm it undoubtedly seemed to him that following counsel and making concessions were a display of weakness. At all events from his December message to the veto of the Civil Rights Bill he yielded not a jot to Congress. The moderate senators and representatives (who constituted a majority of the Union party) asked him for only a slight compromise; their action was really an entreaty that he would unite with them to preserve Congress and the country from the policy of the radicals … His quarrel with Congress prevented the readmission into the Union on generous terms of the members of the late Confederacy … His pride of opinion, his desire to beat, blinded him to the real welfare of the South and of the whole country. Rhodes ascribed Johnson’s faults to his personal weaknesses, and blamed him for the problems of the postbellum South. Other early 20th-century historians, such as John Burgess, Woodrow Wilson (who later became president himself) and William Dunning, all Southerners, concurred with Rhodes, believing Johnson flawed and politically inept, but concluding that he had tried to carry out Lincoln’s plans for the South in good faith. Author and journalist Jay Tolson suggests that Wilson “depict as a vindictive program that hurt even repentant southerners while benefiting northern opportunists, the so-called Carpetbaggers, and cynical white southerners, or Scalawags, who exploited alliances with blacks for political gain”. Even as Rhodes and his school wrote, another group of historians was setting out on the full rehabilitation of Johnson, using for the first time primary sources such as his papers, provided by his daughter Martha before her death in 1901, and the diaries of Johnson’s Navy Secretary, Gideon Welles, first published in 1911. The resulting volumes, such as David Miller DeWitt’s The Impeachment and Trial of President Andrew Johnson (1903), presented him far more favorably than they did those who had sought to oust him. In James Schouler’s 1913 History of the Reconstruction Period, the author accused Rhodes of being “quite unfair to Johnson”, though agreeing that the former president had created many of his own problems through inept political moves. These works had an effect; although historians continued to view Johnson as having deep flaws which sabotaged his presidency, they saw his Reconstruction policies as fundamentally correct. at the end of the 1920s, an historiographical revolution took place. In the span of three years five widely read books appeared, all highly pro-Johnson….They differed in general approach and specific interpretations, but they all glorified Johnson and condemned his enemies. According to these writers, Johnson was a humane, enlightened, and liberal statesman who waged a courageous battle for the Constitution and democracy against scheming and unscrupulous Radicals, who were motivated by a vindictive hatred of the South, partisanship, and a desire to establish the supremacy of Northern big business. In short, rather than a boor, Johnson was a martyr; instead of a villain, a hero. Beale wondered in 1940, “is it not time that we studied the history of Reconstruction without first assuming, at least subconsciously, that carpetbaggers and Southern white Republicans were wicked, that Negroes were illiterate incompetents, and that the whole white South owes a debt of gratitude to the restorers of ‘white supremacy’?” Despite these doubts, the favorable view of Johnson survived for a time. In 1942, Van Heflin portrayed the former president as a fighter for democracy in the Hollywood film Tennessee Johnson. In 1948, a poll of his colleagues by historian Arthur M. Schlesinger deemed Johnson among the average presidents; in 1956, one by Clinton L. Rossiter named him as one of the near-great Chief Executives. Foner notes that at the time of these surveys, “the Reconstruction era that followed the Civil War was regarded as a time of corruption and misgovernment caused by granting black men the right to vote”. Earlier historians, including Beale, believed that money drove events, and had seen Reconstruction as an economic struggle. They also accepted, for the most part, that reconciliation between North and South should have been the top priority of Reconstruction. In the 1950s, historians began to focus on the African-American experience as central to Reconstruction. They rejected completely any claim of black inferiority, which had marked many earlier historical works, and saw the developing Civil Rights Movement as a second Reconstruction; some writers stated they hoped their work on the postbellum era would advance the cause of civil rights. These authors sympathized with the Radical Republicans for their desire to help the African American, and saw Johnson as callous towards the freedman. In a number of works from 1956 onwards by such historians as Fawn Brodie, the former president was depicted as a successful saboteur of efforts to better the freedman’s lot. These volumes included major biographies of Stevens and Stanton. Reconstruction was increasingly seen as a noble effort to integrate the freed slaves into society. We know the results of Johnson’s failuresthat his preternatural stubbornness, his mean and crude racism, his primitive and instrumental understanding of the Constitution stunted his capacity for enlightened and forward-thinking leadership when those qualities were so desperately needed. At the same time, Johnson’s story has a miraculous quality to it: the poor boy who systematically rose to the heights, fell from grace, and then fought his way back to a position of honor in the country. For good or ill, ‘only in America,’ as they say, could Johnson’s story unfold in the way that it did.